Idolsmashers! An iconoclast loves to smash idols! --An explosion blasted away during one of our beginning sessions with the Hippies at the Huntington Beach, California Light Club, the first year of the Revolution for Jesus! How many have found it easy to have your idols smashed? If you have, you're unusual!--God bless you! For most people it's pretty hard to take! "Now listen Lord, can't we just keep this little idol here now?" I know I worshipped this idol for many years and it was very dear to me and I thought this was it, and where it's at--I thought this was great! And now that I've found out it isn't, can't I just keep it in one little back corner of the house someplace? After all, I spent a lot of money on it and it took a lot of time and it's got a lot of pretty decorations and at least it's an ornament! If it's not good for much else; if it's not useful, if it's not good and I can't worship it anymore--can't I just keep it around some place? I think it's pretty nice--not too bad!" Don't you find this true with a lot of things? Don't you find this in your own heart? "Well now Lord, you know, after all, why do I have to give this up?--Now it's not so bad--and it used to be pretty good!--And I used to think it was great! And after all, it may not be useful, but at least maybe it's harmless! And it's pretty and it's expensive and it's decorative and I spent a lot of time and money on it in past years and I thought it was the best once upon a time! Can't I just at least keep it back in the corner someplace?" Wham! Just like that God comes along and smashes that idol! "I will have no other gods before me!" (Exodus 20:3) There is nothing right short of right! Nothing short of right is right! And when you find out that it isn't just right and somebody comes along and smashes that idol it hurts! And it's not easy to take! Think of all the time you wasted in just such affairs! Think of all the time you wasted in just such education! Think of all the time you wasted in just such pretty church services! Think of all the time you wasted in Christian social functions!--Young people's parties!--`Pin the tail on the donkey!' No wonder the tail landed on the tail of some of those donkeys running around!--Bunch of dumb asses! An iconoclast is an idol-smasher and I hate idols! I don't care what they are! An iconoclast loves to smash idols! He enjoys it!--Because he hates them! Do you think it's right to smash idols? Well, let me tell you, you should read a little bit in the Bible about how they went around smashing idols! And the kings who said: "Yes, we'll have a revival and we'll go back to the worship of Jehovah!" but they destroyed not the idols, and they cast not down the altars, and they left the groves...the Lord said what? What did the Lord say? "Therefore this thing displeased the Lord" and He sent this upon them and He sent that upon them and He caused war, and He sent scourge upon them! He'd say about this king or that king, because though they had a real revival and they got back to the true worship they didn't get rid of the old way! They didn't smash the false System! They didn't root out, tear down, destroy and get rid of it entirely so the people could never go back to it again! They didn't burn their bridges behind them! They didn't take off the plow and sacrifice the oxen upon it! As long as that's in the back of your heart and you think it's pretty nice and you wouldn't mind going back to it--you will go back sooner or later and you don't belong here! As long as you still like it, God have mercy on your soul, get back to it and hurry up about it! I hate the meeting in which christians are preaching something that Christians don't need to other Christians who don't need it! And so everybody's happy because it doesn't hurt anybody!--Because you preach salvation and the conviction that you ought to get saved to a bunch of Christians, who's it going to hurt? Who is it going to convict? They're all saved! So everybody's happy and they can really whoop it up! Yes, and healing is something everybody wants and the supernatural blessing is something everybody wants! But you go into a bunch like that and start preaching! "Get out and come to the Light Club! Come down to the beach! Witness every day! Forsake all, sell your house, sell your car, go out and do like the Apostles did!" --and see how popular you are! See how they like it! Smash those idols that they have and see how popular you are! See how they like it! Smash those idols that they have and see how they like it! Iconoclast! That's what god knows that i am! Aaron's another iconoclast! He doesn't give a damn what people think as long as he gets the truth out! If you don't like that kind of wordin', why God help you! I can explain exactly what I mean if you want me to! That's the way God made me! And I want to tell you right now, that unless you're willing to be an iconoclast and ready to destroy the old idols and the old way that is false, fictitious, misleading, deceptive, ineffective, useless...you'll not do a bit of good! As Dr. Koger used to say: "Listen, you know, the doctors that i used to work with used to kind of kid and jive amongst each other because sometimes they'd give the guy a little coloured sugar water and call it medicine and make him pay a fortune for it because they knew nothing would do him any good anyhow, and the guy psychologically just demanded medicine--had to have medicine, and the doctors would laugh about it amongst themselves!" Dr. Emmett Bascom Koger, Miami City physician, chairman of our board in Miami finally telling the truth on the witch-doctors of America! You don't have to go to Africa for them! Wow! I said that in a meeting down in my mother's cottage and one woman went sky-high--her father was a doctor! I said they're a bunch of witch-doctors and medicine men and no better than the guys in Africa a lot of the time! Experimenting around and fiddling around with drugs and stuff and that's why the people are in such a horrible shape, now the doctors got it started! They got it started! They put them on it! They make money on those prescriptions that have to come through them! Selling human misery! Using the souls of men for merchandise, God's Word says! My God help us! And I love to smash idols! I'm sorry for you if i've hit some of yours! But idol-smashing is my business, my son Aaron's business, and obviously Hosea's business and it better get to be your business or you won't do a bit of good! As soon as you're gone they'll go right back to their idols; they'll turn right back to the old System; they'll turn right back to the old rut and the old way! Just like that famous story about the eagle that had been chained so long to that stake in the middle of the ground he'd worn a rut in the ground going round and round and round. And finally the guy was getting old and his master felt sorry for him and thought, "Well, his last days, I'm going to liberate him and set him free!" So he took the metal ring off of his foot and he took the eagle out and up in his hand like this, and he tossed it out into the air. And what do you suppose happened? He flip-flopped as he could barely fly at all--right back down to the ground and he walked back over to the old rut and he stared walking round the rut like that! No chain! No birdband! Just the habit! Smash the habit! Smash the opportunity to get back to the habit! Abolish it and get rid of it like they did in the Old Testament! Damn the idols! Smash 'em! Get rid of them! And if they've got nothing to go back to, nowhere to go: burn the plough! Sacrifice the oxen upon it! Burn your bridges behind you! Forsake your job! Quit school in the middle of the year so you can't even go back! Get thrown out of your house so your folks don't even want you anymore! Spend all your money so you're broke and you can't leave! Burn your bridges behind you, God help you! But as long as you've got any idea there's some place to go back to, you'd better go!--And I don't mean perhaps! As long as you think it's still ok and it's still good, and I don't mind it, and I don't object, and I think it's alright, then you don't belong here! Because I am against it! And I hate that whorish System with every ounce of blood in me!--And I'll probably shed those blood drops before it's over for attacking it! As Martin Luther said to his wife once: "You know i'm not gentle!" Well, it takes that kind of a man to be a revolutionary and a reformer! He tried to reform the System. He tried his best to purify the Catholic Church. And he poured new wine in the old bottle and the old bottle split wide open! Jesus said, you just try to put a new piece of cloth on an old garment and see what happens! It'll rip the garment wide open! Old rotten cloth; new sound piece of cloth: watch out! Get rid of the old bottle and find a new one to pour the new wine into and that's what we've done here most of the time, thank God for that! The main problem we have is some of the old bottles!--Even some pretty young bottles, but they were just bottled in the old System! Six years old and 100 proof! And man, he raises hell! I'd rather have a fresh grape juice that is fermented the way my grandmother did it in the old-fashioned way--doesn't raise as much hell! Might even do you some good! I'm sorry, it hurts! Did we smash any of your idols before we got done with you? Did if hurt? (Ho: What one person finally had to do was go back to his old church and try to tell them himself, that's what did it for him!) That's what'll do it for you! I dare and challenge you with the light God has given you, to conscientiously with conviction and boldness go back to those old friends and go back to those old haunts, and go back to that old System and try to give them what you learned, and if anything will help you smash the idol, that'll do it! I know it! Fred Jordan, the guy that was largely responsible for smashing my idols along that line--and I was as churchy as you can get--I was a Pharisee of the Pharisees, ecclesiastical as could be; and boy, that guy began hammering on those idols! I got so furious, I ran out on his lawn shouting: "There's nothing wrong with the good old church! There's nothing wrong with the good old Church System! And Sunday School for the kids! It did me good, it did my Mother and Dad good, and my grandparents goods and it's still doing a lot of good! And I don't see why you have to break with the System to do what you're doing! I'm not going to break with the System like you! "I'm going back into the System and tell them what you taught me and I believe they'll receive it; I think they'll think it's great! I think they'll get out and witness!" And I spent about three years trying to do it! And this guy that had got me started and set me off along this line--God bless him!--and God still blesses him! God forbid that what happen to him should ever happen to me--that some wife would cause me to compromise and go back into the System! I'd sooner throw the wife out first! I'm not saying my wife is that way, forgive me, don't misunderstand! I'm talking about this other case I'm thinking about. Oh, my wife tends to be a little bit...to try to tone me down to compromise me a little bit, you know, and iron me out! I don't want peace with the System! I want war! I'd rather smash their idols and you don't get peace that way! "I came not to send peace but a sword, to the dividing asunder of families"--and churches, and Christians, believe it or not! ( Mt.10:34-36 ) Because if they can't take it that's what Paul did! If they don't receive it, it's bound to split them wide open! What do you think about that? We tried it in a lot of churches, didn't we? We went back and, I don't know how much faith he had or hope but he was hoping that maybe, you know. One pastor's wife got up on the piano and began to bang on the piano singing at the top of her voice trying to drown me out! Boy, I tell you, I know now why the Lord put that verse in the Bible! Because it really worked! I turned around and I said, "Let the woman keep silence in the church!" Wow! It really worked! ( 1Cor.14:34 ) There's a time for women to speak; they can pray, they can prophesy--a lot of things according to God's Word. But there's a time for them to shut up and keep quiet, especially when they're trying to infringe on a man's time! Now don't get hurt, you dear girls, God bless you, you know I love you. Idol-smashing! 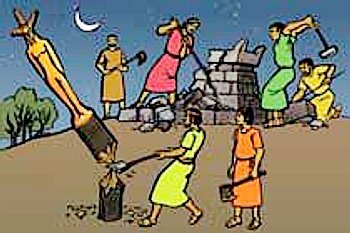 You just read the Bible and see what happened to Israel every time they didn't destroy the idols after an evil king had erected altars and erected idols and groves where they had all kinds of hanky-panky going on--couldn't be mentioned here--well, it could but...it wouldn't shock me but it might shock you! They left the groves of trees out in the woods for their wild picnics and left the idols and they left the altars and every time they did--how many have ever read the Old Testament, let me see? Every time they left them and didn't destroy them so the people had nothing to go back to, what happened? The minute that king was gone and the next king came along they reverted right back! And the only guys who had any type of revival that lasted for any length of time were the guys that just obliterated the old religion so far that it was so far out of sight that they forgot what it was all about! `Course, then they concocted a few new ones! (Maybe the Lord's gong to permit a takeover of the U.S. to obliterate the Church System) I believe it! If we don't destroy and burn 'em down, lock them up and kick the Christians out where they can witness, God will! (Ho: That's right! And He'll use a heathen king to do it!) If you've got any idols that you like and you don't want to destroy and you want to save and you don't think they're too bad and after all, we ought to be able to get along with them.... Not if you're going to be a revolutionist! Not if you're going to be...not a reformer but a revolutionist! Now Luther tried to reform the Catholic Church and he found he couldn't do it. He didn't break with them, they broke with him. And then the people broke loose and they got the point of what Luther was teaching and they became iconoclasts. They began going around in those gorgeous cathedrals and temples that the Catholics had built and began smashing the idols and destroying the pictures and just breaking the windows all to pieces because they considered those idols too--all those pictures and stuff--they were extremists! They had to be! They had worshipped those things! They had worshipped them! So they were angry when they found out they were false! They were mad when they found out they weren't right and they weren't true! So they smashed them instead of just trying to live with them! And they began to burn down a few of the temples too--they got that point too--they didn't need the buildings any more either! And they had a revolution on their hands called the Peasants War. I don't know what would have happened if Luther would have agreed with them and fought with them. I don't know, maybe they would have wiped out the Catholic Church entirely. But Luther, in that case, I am sorry to say, one of my greatest heroes, became a compromiser and to try to spare, he sided with the rulers and the ruling classes in that war against the peasants who were trying to smash the power of the Catholic Church completely and smash its temples and its idols and its hierarchy! And I think if I'd been there I'd have been on their side! I don't like violence toward people, but I don't hesitate in trying to smash the System! I even love the Christians! "Wow, MO, you love Christians?--you sure don't sound like it!" I just hate what they're doing! I'd like to clobber 'em a little bit to wake 'em up!--with the truth! I haven't hit anybody here over the top of the head yet have I?--except with a Bible! If I hit your head with this one, boy, you'll know it! Ha! With the Truth! Yes, Miguel? (I got a scripture: Ex.3:13,14 says, "And Moses said unto God, Behold, when I come unto the children of Israel, and shall say unto them, the God of your fathers hath sent me unto you; and they shall say to me, What is his name? What shall I say unto them? And God said unto Moses, I AM THAT I AM: and he said, Thus shalt thou say unto the children of Israel, I AM hath sent me unto you.") Yes, not the District Superintendent not the Bishop, not the local presbyter but God sent me! That's what the Lord told us when we started on this journey. He said that if you're willing to say that just God sent you, when they ask you who you are and where you came from if you're just willing to say God sent you and let others get the credit for what you do...two things the Lord said: If you're willing to say that God sent you and let others get the credit for what you do, which is about what we're about to do again at the Light Club. We had our little day, we had our little fling there for about a month and a half. Most people didn't even know if was still there and those that did still thought it was Teen Challenge, anyhow, so they probably all get the credit and on television it was Teen Challenge and blah, blah, blah. So they're all getting the credit but that's what the Lord said. He said if you're willing to just say God sent you and you don't belong to anything, nothing nobody just God sent you and let others get the credit for what you do, He said, then I'll mightily bless and use you! Are you willing to do that? It's not always easy! It smashes your idols! I'm proud of you kids! I like to see people commend you and to know that it was you that did it. But our enemies are like the Scribes and Pharisees and the Israelites who refused to believe the prophets. So if you're still in league with the Enemy please either break it off or break it up and get out of here! I don't like these people who keep running back and forth trying to worship God and Baal! Thank God for the little people who've got nothing to run back to! They didn't have anything in the first place! They weren't part of that System! They don't have that System to run back to; they never knew anything about it! Never went to church! Boy, they've really got a headstart on you guys with years of church and Bible college and everything behind you!--You've got so much to unlearn! It's almost impossible to regroove you! I'm telling you, if you can stand three or four years in Bible college...I don't know! (Ho: Dad, in confirmation to what you just said, it really thrilled my heart last night when we were sitting there at the table and Bobby asked me as we were talking about people trying to get the System out of you and how long it took to brainwash 'em and she said, how long does it take for the people that haven't been that way?--And I said, oh, it's much shorter And then later on in the conversation we were talking about different groups, she said, oh, by the way, what is a Pentecostal?) Hallelujah! Praise God! Oh Boy, thank God! I hope she never learns what a Pentecostal is! How do you like that? I hope she never learns what a Pentecostal is--and I sure hope she's not like one! Because nearly all the Pentecostals I know just like to go to church and blah, blah, blah in church and go home and do nothing! Now what a Christian is, and what a disciple is...or an apostle, or a missionary, or a prophet is, is an iconoclast!...Amen? God bless you! I love you!